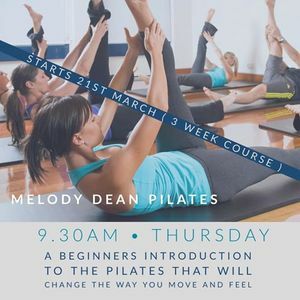 This course has been put together for those new to Pilates but is also suitable for those wanting to revisit the core principles of this fabulous discipline. Melody will take you through the fundamentals of Pilates to help you find balance, strength and poise in your own body. Over the weeks you will observe your own postural imbalances and how to correct them. Melody will then discuss and demonstrate some of the key foundational movements so you can feel prepared to join an established class. The course runs over 3 weeks starting on Thursday 21st March Thursday - 4th April at 9.30am. Course cost is £25 per person booking essential - to book contact Melody for payment information. Tea, cake and chats included. Wear something you can move easily in and be prepared to have a good time. Keep and open mind and heart. Melody has lots of fun in her sessions. Good vibes only ??? Melody teaches Pilates passionately as it played a huge part in her husbands recovery from spinal injury and surgery. Inspired by how much it helped him she now dedicates a huge amount of time to creating sessions to building strong bodies and minds.